It comes from outer space, the ground, and even from within our own bodies. 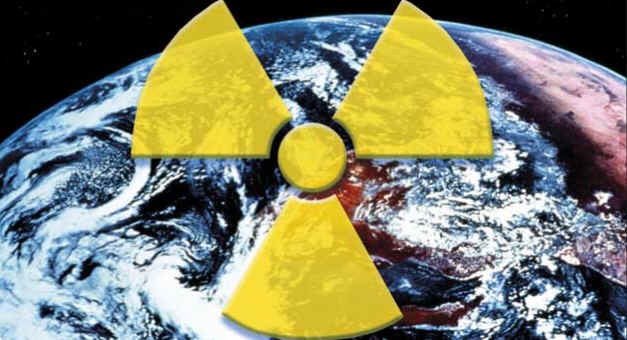 Radiation is all around us and has been present since the birth of this planet. Radiation simply is part of our daily lives. The word, “radiation,” generally brings to mind nuclear power plants, nuclear weapons, or medical diagnostics and treatments. Nonetheless, we routinely encounter a variety of radiation sources every day, for example, smoke detectors, household appliances, electrical power lines, and even the sun. Radiation is energy that travels in the form of waves or high speed particles and it makes up the electromagnetic spectrum. 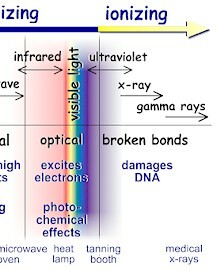 The electromagnetic spectrum is divided into two major categories: ionizing radiation and non-ionizing radiation. Ionizing radiation has enough energy to break chemical bonds in molecules or remove tightly bound electrons from atoms, thus creating charged molecules or atoms (ions). There are three major types of ionizing radiation: gamma rays and x-rays, alpha particles, and beta particles. Non-ionizing radiation has enough energy to move around the atoms in a molecule or cause them to vibrate, but not enough to remove electrons. Non-ionizing radiation ranges from extremely low frequency radiation, shown on the far left through the audible, microwave, and visible portions of the spectrum into the ultraviolet range. Extremely low-frequency radiation has very long wave lengths (on the order of a million meters or more) and frequencies in the range of 100 Hertz (cycles per second) or less. Radio frequencies have wave lengths of between one and 100 meters and frequencies in the range of one million to 100 million Hertz. Microwaves that we use to heat food have wavelengths that are about one hundredth of a meter and have frequencies of about 2.5 billion Hertz. Higher frequency ultraviolet radiation begins to have enough energy to break chemical bonds. 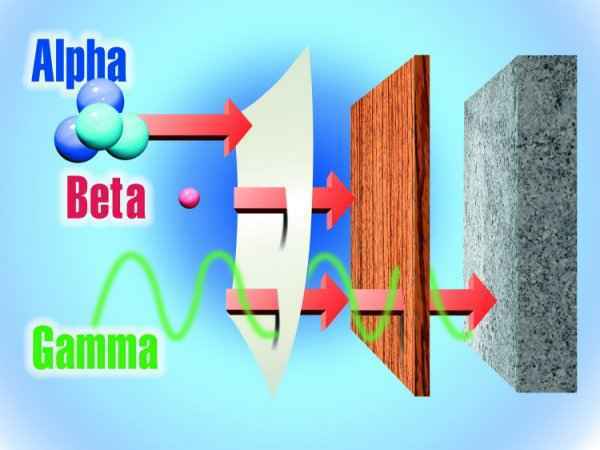 X-ray and gamma ray radiation, which are at the upper end of magnetic radiation, have very high frequencies (in the range of 100 billion billion Hertz) and very short wavelengths of about 1 picometer (1 trillionth of a meter). Radiation in this range has extremely high energy. It has enough energy to strip off electrons or, in the case of very high-energy radiation, break up the nucleus of atoms. Ionization is the process in which a charged portion of a molecule (usually an electron) is given enough energy to break away from the atom. This process results in the formation of two charged particles or ions: the molecule with a net positive charge and the free electron with a negative charge. Each ionization releases approximately 33 electron volts (eV) of energy. Material surrounding the atom absorbs the energy. Compared to other types of radiation that may be absorbed, ionizing radiation deposits a large amount of energy into a small area. In fact, the 33 eV from one ionization is more than enough energy to disrupt the chemical bond between two carbon atoms. All ionizing radiation is capable, directly or indirectly, of removing electrons from most molecules. These are helium nuclei consisting of two protons and two neutrons and are emitted from naturally-occurring heavy elements such as uranium and radium, as well as from some man-made transuranic elements. They are intensely ionizing but cannot penetrate the skin, so are dangerous only if emitted inside the body. These are fast-moving electrons emitted by many radioactive elements. They are more penetrating than alpha particles, but easily shielded – they can be stopped by a few millimetres of wood or aluminium. They can penetrate a little way into human flesh but are generally less dangerous to people than gamma radiation. Exposure produces an effect like sunburn, but which is slower to heal. Beta-radioactive substances are also safe if kept in appropriate sealed containers. These are high-energy beams much the same as X-rays. They are emitted in many radioactive decays and are very penetrating, so require more substantial shielding. Gamma rays are the main hazard to people dealing with sealed radioactive materials used, for example, in industrial gauges and radiotherapy machines. Radiation dose badges are worn by workers in exposed situations to detect them and hence monitor exposure. All of us receive about 0.5-1 mSv per year of gamma radiation from cosmic rays and from rocks, and in some places, much more. Gamma activity in a substance (e.g. rock) can be measured with a scintillometer or Geiger counter. X-rays are also ionizing radiation, virtually identical to gamma rays, but not nuclear in origin. Cosmic radiation consists of very energetic particles, mostly protons, which bombard the Earth from outer space. Neutrons are mostly released by nuclear fission (the splitting of atoms in a nuclear reactor), and and hence are seldom encountered outside the core of a nuclear reactor. Thus they are not normally a problem outside nuclear plants. Fast neutrons can be very destructive to human tissue. Radiation that has enough energy to move around atoms in a molecule or cause them to vibrate, but not enough to remove electrons, is referred to as "non-ionizing radiation." Examples of this kind of radiation are sound waves, visible light, and microwaves. Radiation that falls within the "ionizing radiation" range has enough energy to remove tightly bound electrons from atoms, thus creating ions. This is the type of radiation that people usually think of as 'radiation.' We take advantage of its properties to generate electric power, to kill cancer cells, and in many manufacturing processes. The energy of the radiation shown on the spectrum below increases from left to right as the frequency rises. How does radiation enter the environment? Radiation in our environment comes from both natural and man-made sources. In addition, mining and other commercial activities can disturb naturally-occurring radioactive materials by uncovering them. This can lead to direct exposure of individuals from radioactivity in the soil or to weathering which may release radioactive soils to the environment as air- and/or water-borne radioactivity. Ore processing activities also can concentrate naturally-occurring radioactive materials. Many of the radionuclides in the Earth's crust were formed along with Earth itself and have half-lives measured in billions of years. As a result, they are present in essentially the same amount as they were when Earth was formed. These radionuclides are known as "primordial radionuclides. Radionuclides are continuously produced by the bombardment of stable atoms by cosmic rays, largely in the atmosphere. These are known as "cosmogenic radionuclides." Since the discovery of naturally-occurring radioactive materials in 1896 and the first human-engineered release of energy from the atomic nucleus in 1939, scientists and engineers have developed a wide variety of applications for radioactive materials. In addition, research has led to the discovery and creation of additional radioactive elements. This widening manufacture and use of radioactive elements has led to environmental contamination, particularly during the period before the health and environmental effects of radiation were clearly understood and protective regulations put in place. Facilities that produce weapons and manufacture items that use radioactive sources may release small quantities of radionuclides to the environment (Nuclear Regulatory Commission regulations allow small amounts of certain radionuclides to be released into the air or flushed down drains as liquids). "Orphan" sources are radioactive sources that have fallen out of regulatory control. Depending on their form, the pose different threats. Some can be broken with the resulting release of radioactive materials to the atmosphere. Some could expose people who are unfamiliar with sources, and inadvertently handle them. Others could be incorporated into scrap metal shipments and contaminate entire batches of metal when melted in a steel mill. Orphan sources also are potential components of improvised nuclear devices (dirty bombs). When items such as household smoke detectors containing americium-241 and exit signs containing tritium are discarded as ordinary trash, they go directly to municipal landfills, where the radionuclides they contain may enter ground water and be carried into the rest of the environment. Accidental releases such as the Chernobyl accident in the Ukraine release radionuclides to the environment. Improperly disposed medical waste also can be a source of radionuclides in the environment. Produce new chemical bonds and cross-linkage between macromolecules. Damage molecules that regulate vital cell processes (e.g. DNA, RNA, proteins). The cell can repair certain levels of cell damage. At low doses, such as that received every day from background radiation, cellular damage is rapidly repaired. At higher levels, cell death results. At extremely high doses, cells cannot be replaced quickly enough, and tissues fail to function. This also means that a developing embryo is most sensitive to radiation during the early stages of differentiation, and an embryo/fetus is more sensitive to radiation exposure in the first trimester than in later trimesters. Radiation effects can be categorized by when they appear. High doses delivered to the whole body of healthy adults within short periods of time can produce effects such as blood component changes, fatigue, diarrhea, nausea and death. These effects will develop within hours, days or weeks, depending on the size of the dose. The larger the dose, the sooner a given effect will occur. Cataracts are induced when a dose exceeding approximately 200-300 rem is delivered to the lens of the eye. Radiation-induced cataracts may take many months to years to appear. Studies of people exposed to high doses of radiation have shown that there is a risk of cancer induction associated with high doses. The specific types of cancers associated with radiation exposure include leukemia, multiple myeloma, breast cancer, lung cancer, and skin cancer. Radiation-induced cancers may take 10 - 15 years or more to appear. There may be a risk of cancer at low doses as well. Rapidly proliferating and differentiating tissues are most sensitive to radiation damage. Consequently, radiation exposure can produce developmental problems, particularly in the developing brain, when an embryo/fetus is exposed pre-natally. The developmental conditions most commonly associated with prenatal radiation exposure include low birth weight, microcephaly, mental retardation, and other neurological problems. These effects are related to the developmental stage at which the exposure occurs. The threshold dose for developmental effects is approximately 10 rems. The evidence that the developing embryo/fetus is more sensitive to radiation-induced cancer is inconclusive. But it is prudent to assume that there is some increased sensitivity. We tend to think of biological effects of radiation in terms of their effect on living cells. For low levels of radiation exposure, the biological effects are so small they may not be detected. The body has repair mechanisms against damage induced by radiation as well as by chemical carcinogens. Consequently, biological effects of radiation on living cells may result in three outcomes: (1) injured or damaged cells repair themselves, resulting in no residual damage; (2) cells die, much like millions of body cells do every day, being replaced through normal biological processes; or (3) cells incorrectly repair themselves resulting in a biophysical change. Health and Human Services literature also suggests a possible association between ionizing radiation exposure and prostate, nasal cavity/sinuses, pharyngeal and laryngeal, and pancreatic cancer. The period of time between radiation exposure and the detection of cancer is known as the latent period and can be many years. Those cancers that may develop as a result of radiation exposure are indistinguishable from those that occur naturally or as a result of exposure to other carcinogens. Furthermore, National Cancer Institute literature indicates that other chemical and physical hazards and lifestyle factors (e.g., smoking, alcohol consumption, and diet) contribute significantly to many of these same diseases. Although radiation may cause cancers at high doses and high dose rates, currently there are no data to establish unequivocally the occurrence of cancer following exposure to low doses and dose rates – below about 10,000 mrem (100 mSv). Those people living in areas having high levels of background radiation – above 1,000 mrem (10 mSv) per year – such as Denver, Colorado, have shown no adverse biological effects. Even so, the radiation protection community conservatively assumes that any amount of radiation may pose some risk for causing cancer and hereditary effect, and that the risk is higher for higher radiation exposures. A linear, no-threshold (LNT) dose response relationship is used to describe the relationship between radiation dose and the occurrence of cancer. This dose-response hypothesis suggests that any increase in dose, no matter how small, results in an incremental increase in risk. The LNT hypothesis is accepted by the NRC as a conservative model for determining radiation dose standards, recognizing that the model may over estimate radiation risk. High radiation doses tend to kill cells, while low doses tend to damage or alter the genetic code (DNA) of irradiated cells. High doses can kill so many cells that tissues and organs are damaged immediately. This in turn may cause a rapid body response often called Acute Radiation Syndrome. The higher the radiation dose, the sooner the effects of radiation will appear, and the higher the probability of death. This syndrome was observed in many atomic bomb survivors in 1945 and emergency workers responding to the 1986 Chernobyl nuclear power plant accident. Approximately 134 plant workers and firefighters battling the fire at the Chernobyl power plant received high radiation doses – 80,000 to 1,600,000 mrem (800 to 16,000 mSv) – and suffered from acute radiation sickness. Of these, 28 died within the first three months from their radiation injuries. Two more patients died during the first days as a result of combined injuries from the fire and radiation. Because radiation affects different people in different ways, it is not possible to indicate what dose is needed to be fatal. However, it is believed that 50% of a population would die within thirty days after receiving a dose of between 350,000 to 500,000 mrem (3500 to 5000 mSv) to the whole body, over a period ranging from a few minutes to a few hours. This would vary depending on the health of the individuals before the exposure and the medical care received after the exposure. These doses expose the whole body to radiation in a very short period of time (minutes to hours). Similar exposure of only parts of the body will likely lead to more localized effects, such as skin burns. Conversely, low doses – less than 10,000 mrem (100 mSv) – spread out over long periods of time (years) don't cause an immediate problem to any body organ. The effects of low doses of radiation, if any, would occur at the cell level, and thus changes may not be observed for many years (usually 5-20 years) after exposure. Genetic effects and the development of cancer are the primary health concerns attributed to radiation exposure. The likelihood of cancer occurring after radiation exposure is about five times greater than a genetic effect (e.g., increased still births, congenital abnormalities, infant mortality, childhood mortality, and decreased birth weight). Genetic effects are the result of a mutation produced in the reproductive cells of an exposed individual that are passed on to their offspring. These effects may appear in the exposed person's direct offspring, or may appear several generations later, depending on whether the altered genes are dominant or recessive. Although radiation-induced genetic effects have been observed in laboratory animals (given very high doses of radiation), no evidence of genetic effects has been observed among the children born to atomic bomb survivors from Hiroshima and Nagasaki. When scientists measure radiation, they use different terms depending on whether they are discussing radiation coming from a radioactive source, the radiation dose absorbed by a person, or the risk that a person will suffer health effects (biological risk) from exposure to radiation. This fact sheet explains some of the terminology used to discuss radiation measurement. Most scientists in the international community measure radiation using the System Internationale (SI), a uniform system of weights and measures that evolved from the metric system. In the United States, however, the conventional system of measurement is still widely used. Different units of measure are used depending on what aspect of radiation is being measured. For example, the amount of radiation being given off, or emitted, by a radioactive material is measured using the conventional unit curie (Ci), named for the famed scientist Marie Curie, or the SI unit becquerel (Bq). 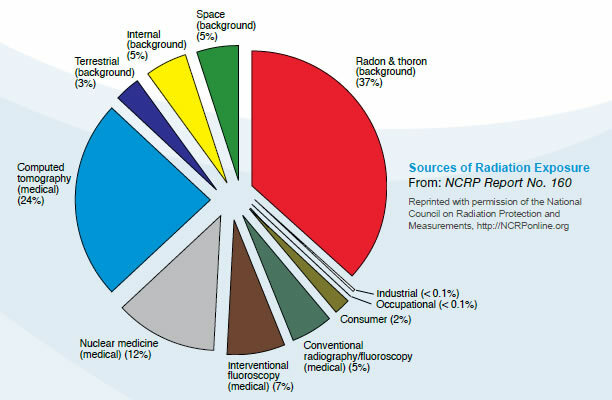 The radiation dose absorbed by a person (that is, the amount of energy deposited in human tissue by radiation) is measured using the conventional unit rad or the SI unit gray (Gy). 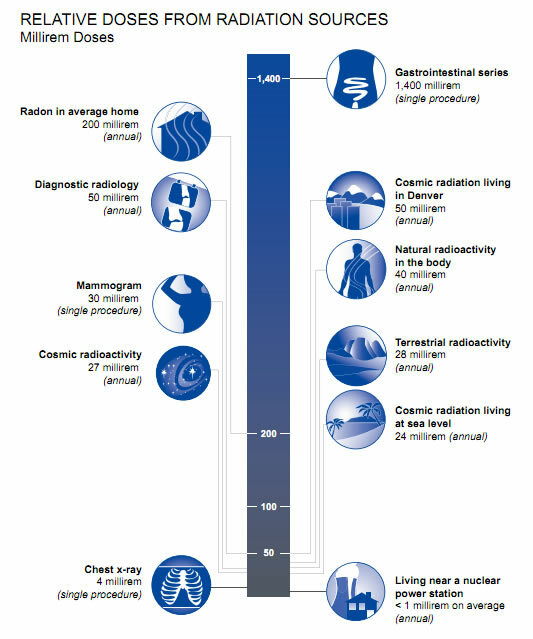 The biological risk of exposure to radiation is measured using the conventional unit rem or the SI unit sievert (Sv). When the amount of radiation being emitted or given off is discussed, the unit of measure used is the conventional unit Ci or the SI unit Bq. A radioactive atom gives off or emits radioactivity because the nucleus has too many particles, too much energy, or too much mass to be stable. The nucleus breaks down, or disintegrates, in an attempt to reach a nonradioactive (stable) state. As the nucleus disintegrates, energy is released in the form of radiation. The Ci or Bq is used to express the number of disintegrations of radioactive atoms in a radioactive material over a period of time. For example, one Ci is equal to 37 billion (37 X 109) disintegrations per second. The Ci is being replaced by the Bq. Since one Bq is equal to one disintegration per second, one Ci is equal to 37 billion (37 X 109) Bq. Ci or Bq may be used to refer to the amount of radioactive materials released into the environment. For example, during the Chernobyl power plant accident that took place in the former Soviet Union, an estimated total of 81 million Ci of radioactive cesium (a type of radioactive material) was released. 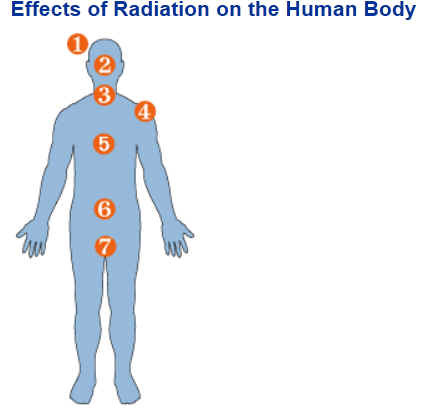 When a person is exposed to radiation, energy is deposited in the tissues of the body. The amount of energy deposited per unit of weight of human tissue is called the absorbed dose. Absorbed dose is measured using the conventional rad or the SI Gy. The rad, which stands for radiation absorbed dose, was the conventional unit of measurement, but it has been replaced by the Gy. One Gy is equal to 100 rad. A person's biological risk (that is, the risk that a person will suffer health effects from an exposure to radiation) is measured using the conventional unit rem or the SI unit Sv. To determine a person's biological risk, scientists have assigned a number to each type of ionizing radiation (alpha and beta particles, gamma rays, and x-rays) depending on that type's ability to transfer energy to the cells of the body. This number is known as the Quality Factor (Q). When a person is exposed to radiation, scientists can multiply the dose in rad by the quality factor for the type of radiation present and estimate a person's biological risk in rems. Thus, risk in rem = rad X Q. The rem has been replaced by the Sv. One Sv is equal to 100 rem. When the amounts of radiation being measured are less than 1, prefixes are attached to the unit of measure as a type of shorthand. This is called scientific notation and is used in many scientific fields, not just for measuring radiation. The table below shows the prefixes for radiation measurement and their associated numeric notations. When the amount to be measured is 1000 (that is, 1 X 103) or higher, prefixes are attached to the unit of measure to shorten very large numbers (also scientific notation). The table below shows the prefixes used in radiation measurement and their associated numeric notations. People are exposed to radiation daily from different sources, such as naturally occurring radioactive materials in the soil and cosmic rays from outer space (of which we receive more when we fly in an airplane). Some common ways that people are exposed to radiation and the associated doses are shown in the table below.